View our latest projects in Richmond, what kitchen, appliances and accessories brands have been used to create those amazing designs, you can also view customers reviews on these designs. Luxury handleless Kitchen combining Frosty White and dark Manhatan Concrete units. Stylish worktop, exceptional appliances and outstanding island with breakfast bar. If you are seriously addicted to traditional whites and pale neutrals but at the same time like to experiment with exciting new materials, then this handleless White and Concrete Kitchen is a clear winner. In this project, the classic white works as the perfect starting point, as it serves as an elegant base and yet, it blends in effortlessly with the contrasting grey element of the lower units, coated in real Concrete. Additionally, it makes way for the sublime marble effect worktop, wrapping the island and covering the remaining surfaces. In this design, the charming colour contrast of the white and grey tones is undoubtedly the key element behind this dramatic look. Concrete can turn ordinary into glamorous. 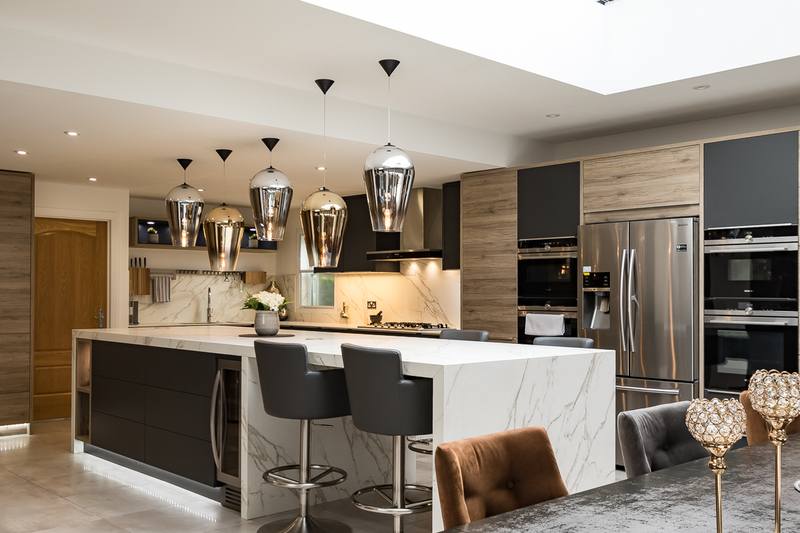 This modern open plan Kitchen is stylish and characterful. To achieve this look, an elegant and simple white backdrop has been created with the tall units in white which keeps the space fresh and brings in light. The lower units have been glamorised with a sprayed layer of real Concrete. This revolutionary hand-crafted production method gives each front its uniquely individual character. In this way, the varied grey texture of Concrete is deliberately transferred into the Kitchen. The individual grey pattern of the Concrete fronts is almost enough to transform this Kitchen, breaking the otherwise clinically white theme and therefore transforming the whole room with warmth, texture and an authentic feel. The elegant worktop in marble effect Dekton Aura 15, works by making the perfect finishing statement, like a cherry on a cake. In this Kitchen, it’s not only the fabulous cabinetry that makes a statement. Functionality and elegance also appear in the shape of the state-of-the-art electric appliances. Here, the cooktop of choice is the Bora Professional Cooktop. This innovative Kitchen cooktop has its extractor built within, this means that cooking vapours can be suctioned away exactly where they arise: directly at the cookpot, from pots, frying pans or grills. It has been described as “the piece of résistance” of modern Kitchen appliances. It combines simplicity, functionality and optimum performance in a single, electrically controlled system. The cooktops and the cooktop extractor communicate with each other and even the cover flap opens and closes automatically. Additionally, the integrated electric Siemens appliances (Single Oven with Grill, Micro-oven, Fridge Freezer and Warming Drawer) along with the Miele integrated Dishwasher, fits well with the whole streamline look and adds practicality and a contemporary feel to the Kitchen. Still keeping up with the idea of stylish, practical and smart living, there’s the hot-water tap, which works by keeping work surfaces as free of clutter as possible, as it replaces the need of a kettle. The Fusion Square Brushed Chrome Quooker tap is the latest in hot-water taps in the current market. It gives instant access to 100 degrees boiling water, helping to save energy, time and money. It also has a separate function of offering filtered water that is processed through activated carbon filters ensuring water that smells and tastes better, adding the last detail to a fully modern Kitchen. Choosing contrasting colour tones usually helps define zones in large open-plan rooms. In this Kitchen dinner, the streamlined handleless white cabinetry against the wall, draws the eye and injects light into this large area. The central island in grey Concrete, with the marble effect down-turns and adorned by the breakfast bar in concrete reproduction, is a social station that celebrates colour contrast and instantly uplifts the whole room. In this open Kitchen, the island very elegantly takes on several functions: it structures the room, offers ample storage space and introduces a more formal dining area. The dining table, also in concrete reproduction, matches the breakfast bar. The natural wood floors soften the strong contrast colour effect, adding to the room a warm elegance. Another successfully completed project by RICHMOND KITCHENS. Here is a perfect example of combining different and exciting materials to achieve perfect harmony. The dark tones of the bondi Carbon Grey supper matt make a strong statement, adding mystery and drama, while the wood effect from the Synthia Antique Oak brings in a natural appearance and homeliness. These two contrasting elements, combined with the white surface of the Neolith Calacatta marble effect, translate into a Kitchen oozing elegance, unrivalled distinction and long-lasting character. The Bondi Carbon Grey cabinet fronts from Leicht are given a special lacquer finish that has a pleasant surface feel and an anti-fingerprint effect. The long bar handles, fitted to some, but not all units, emphasise the horizontal lines and help to define the modern look. The handleless units are fitted with push catch door systems. The clients have opted for integrated electrical ovens. The Siemens Multipurpose ovens (Microwave, Steam and 2 Electric) stand proudly in the high units and provide functionality as well as comfort. The worktop proposed for this Kitchen project, is the Neolith Calacatta. The authentic marble effect is further enhanced by the boldness of the grey and the warm of the browns, and complements the decor. The virtually seamless transition between the worktop and the splashback, with the veins continuing down the splashback and along the worktop, makes a coherent, consistent overall impression. Another successful project completed by Richmond Kitchens. Kitchen Design by Liam Springer. If you would like to see another Kitchen Project in Leicht Carbon Grey, please click here. At Richmond Kitchens, we design, supply and fit quality German and British kitchens from modern handle-less to more traditional shaker style. 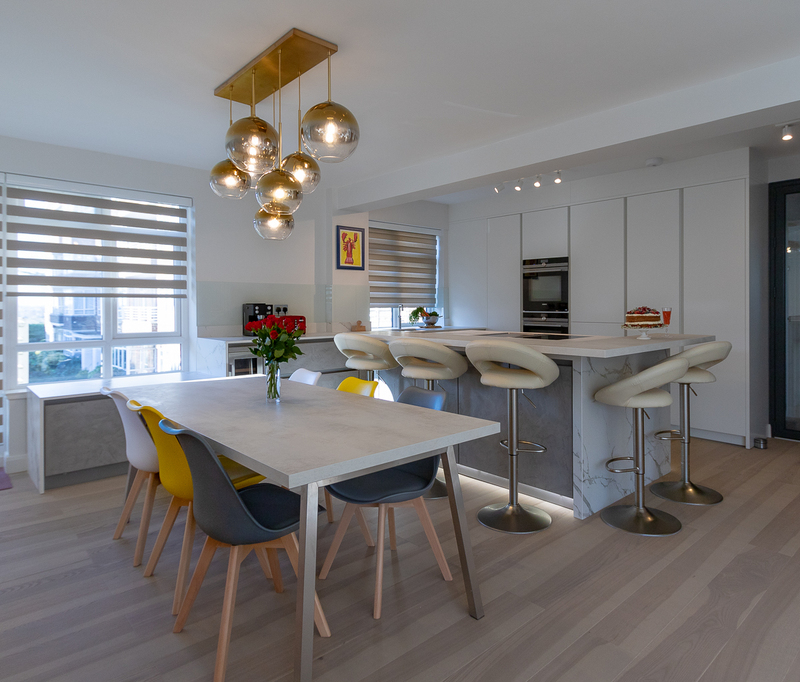 We have successfully installed many modern and classic kitchens in London specially west London boroughs such as Richmond, Kingston, Hammersmith, Acton, Chiswick, Fulham, Kensington, Putney, Hampton, Ealing, Wimbeldon and others.